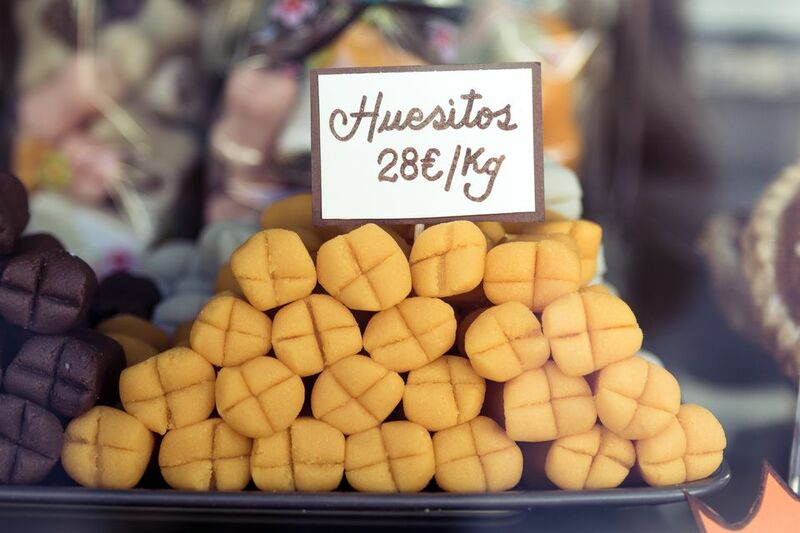 Despite the odd name, huesos de santo or "saint's bones" are delicious treats. The Spanish traditionally eat them on November 1 as part of their All Saints' Day activities. That's the day when families gather and visit their loved ones' graves. The funny name of this sweet comes from the appearance of a white bone on the outside and is filled with a sticky yellow filling. To prepare these sweet "bones," a marzipan paste is first made from ground almonds and sugar. After cooling, the marzipan is rolled out and formed into tubes. Beaten egg yolks and sugar are heated to create a thick paste and then squeezed into the hollow tubes with a pastry bag. Note: while there are multiple steps to this recipe, this dish is broken down into workable categories to help you better plan for preparation and cooking. ​Purchase peeled, raw almonds at the store, or blanch raw almonds and remove the skin. Dry them thoroughly with paper towels. Grind the almonds to a fine dust in a food processor. Set aside. Pour 1 1/2 ounces water and 3 1/2 ounces sugar into a medium size saucepan. Heat on high and bring to a boil while stirring until sugar is dissolved. Remove from heat and stir in ground almonds. Set aside and allow to cool. Once cool to the touch, place in refrigerator to cool for 30 minutes, so it is not as sticky and is easier to work with. Remove the marzipan from the refrigerator. Dust a board generously with powdered sugar. Place marzipan on board and dust top with sugar. Roll marzipan out to about 1/4-inch thick using a rolling pin. Cut into squares about 1 to 1 1/2-inches square. Using the handle of a wooden spoon, wrap marzipan around it and press the ends to seal, forming a little tube. Carefully remove each tube from handle, and place them on a cookie sheet. Heat 3 cups of water in a medium saucepan. Pour 1 ounce of water and 2 ounces sugar into a small saucepan and bring to a boil to form a syrup. While waiting for water to boil, break the eggs into a heatproof bowl and beat the eggs. Slowly pour the syrup into the eggs while stirring with a fork or wire whip. Transfer the bowl on top of the boiling water to make a water bath. Continue to stir the yolk filling until it becomes very thick like a pudding. Spoon the yolk filling into a pastry bag and squeeze the filling into each marzipan tube, from each end. Score the marzipan using the tines of a fork to give it slight ridges.